In the bright heat of a Berlin summer morning, the flags above the Reichstag flew at half-mast. And in the chamber beneath the great glass dome, there was a sombre atmosphere as German politicians paid tribute to the country's longest-serving post-war chancellor, who died on Friday at the age of 87. "We owe it to Helmut Kohl" said the speaker of the house, Norbert Lammert, "that a peacefully united Germany in a free and peaceful Europe is a reality". How ironic, then, that as Europe prepares to publicly honour the man often referred to as the chancellor of unity, it is becoming increasingly clear that Helmut Kohl also left behind a personal legacy of discord and acrimony. 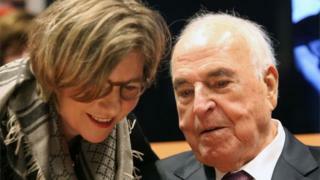 Even as MPs stood for a minute's silence, German TV news programmes were running reports of the escalating conflict within Helmut Kohl's family. Extraordinary footage has emerged of his son Walter and two of his grandchildren arriving, dressed smartly in black clothes, at the family home in Ludwigshafen. In front of journalists and well-wishers bringing flowers and candles, they knocked several times but were apparently refused entry and eventually escorted away by a policeman, who was overheard telling Mr Kohl that there was a restraining order in place which prevented him from visiting the property. It is common knowledge here that Walter Kohl does not get on with his father's second wife. And an undignified public row over the episode at the house has erupted as Maike Kohl-Richter's lawyer issued a statement blaming Mr Kohl for his actions. Mrs Kohl-Richter, an economist who once worked for the late chancellor, is herself a controversial figure who, as her husband's health declined, fiercely guarded access to the former chancellor. They married in 2008 after he suffered a severe brain injury which left him largely unable to speak. She was more than 30 years his junior and, following the marriage, Mr Kohl became estranged from the rest of his family and was rarely seen in public. Nevertheless, his opinions still made headlines, thanks largely to one of his very few confidants, Kai Diekmann, the former editor of Germany's tabloid newspaper Bild. It is through Mr Diekmann that we know that Helmut Kohl will not be buried alongside his first wife, who took her own life in 2001. Hannelore Kohl, who suffered from a debilitating allergy to sunlight, is buried in the Kohl family grave in Ludwigshafen. According to Mr Diekmann, Helmut Kohl and his second wife changed his funeral plans two years ago when he was seriously ill. He will now be laid to rest in the grounds of Speyer Cathedral. But what has intrigued many Germans is the late chancellor's apparent decision to refuse a state memorial ceremony. Mrs Kohl-Richter has insisted his wish is honoured and so, instead, a European service will be held in Strasbourg Cathedral. It is widely believed that Mr Kohl, who was notorious for harbouring resentment, held many current German ministers in contempt. Do not forget, after all, that Angela Merkel, once the protegee he referred to as his "Mädchen" (girl), betrayed him by highlighting his role in a party corruption scandal. Mr Kohl, it appears, neither forgave nor forgot. Maike Kohl-Richter reportedly tried, and failed, to prevent the German chancellor from speaking at the Strasbourg memorial. In addition to the praise heaped upon the late chancellor in the German parliament on Thursday, the speaker of the house also said that Helmut Kohl had "sometimes an exceptionally stubborn personality". It was, of course, a characteristic that helped him to achieve the political victories for which he is now so widely lauded. As the funeral arrangements are made and as the biographies and eulogies are prepared, the Kohl family continues to squabble. Kohl's political creed was said to have been shaped by his childhood in the destruction of wartime Germany. He understood how terrible the consequences of division could be. He also knew, perhaps better than anyone, how hard it is to heal such discord.